This is the long-awaited final entry into my series about money, and also my entry into Encore's World of TV and Film's blogathon "Motifs in Cinema", where I've obviously chosen the "Economics and Money" motif. 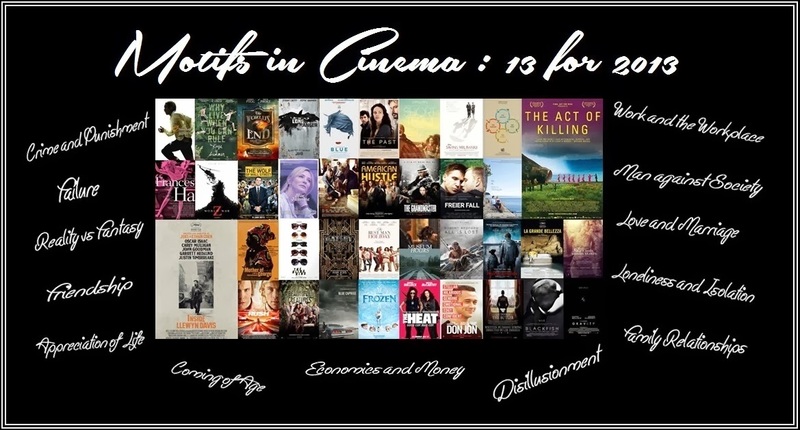 Here's a little more info here: Motifs in Cinema is a discourse across film blogs, assessing the way in which various thematic elements have been used in the 2013 cinematic landscape. How does a common theme vary in use from a comedy to a drama? Are filmmakers working from a similar canvas when they assess the issue of death or the dynamics of revenge? Like most things, a film begins with an idea – Motifs in Cinema assesses how various themes emanating from a single idea change when utilized by varying artists. Also in the series about money: We Might Be Hollow, But We're Brave: Spring Breakers and The Bling Ring (young girls and money) and Baby, You're a Rich Man: The Wolf of Wall Street and Pain & Gain (men and money). And for those wondering why I haven't/am not going to cover The Great Gatsby in this 'series', unbelievably I've had enough of incessantly making a case for talking about it and that's all about old money and stuff so yeah. There's a bit of spoilerage here for Side Effects, but y'all should have seen it by now. I'm a big "past" person - always looking back at things and internally crying that they are no more. Alas, I don't think I have such a problem with the past as Jasmine French does in Blue Jasmine and Emily Taylor in Side Effects. Why? They used to have money. And they miss it now it's gone. "Imagine everything you ever wanted shows up one day and calls itself your life. And then just when you start to believe in it - gone. And suddenly it gets very hard to imagine a future. That's depression, right?" Who knows if Emily Taylor came from a place of wealth before she met her husband, Martin, who gave her all of the riches she needed. But once it's all gone, she isn't terribly interested in reverting back to a life without wealth. No, she doesn't go off and rob celebrity houses or hook up with a guy with cornbraids and shorts in every colour. Instead, we have the rather intricate and complicated plot of Side Effects, which takes a sharp turn three quarters of the way through the film and gives us a twist which was pretty unexpected. Let's just say, it is an elaborate twist, which involves faking depression to the extent of being put in a home, driving stock prices and a lesbian relationship between Rooney Mara and Catherine Zeta-Jones. Let's just say, Emily really wanted her money back. She even killed her husband (who lost the money for her) just to do it. Yes, that's crazy. But the crazy thing is that she's doing it for revenge. While Martin isn't offered a lot of screentime, you can see that he's trying to make the effort to get the money back, and they're living a pretty comfortable life together. Emily, however, seems bent on getting revenge on her husband for making her life miserable and moneyless for a couple of years. Not a long time in the grand scheme of things, but it shows where her loyalties lie: it's all about the money, who even cares about the husband who got all the money for her in the first place? In Blue Jasmine, however, we have Jasmine French, who was introduced to an extravagant and opulent life by her husband, who in turn was arrested for ripping off a whole lot of people and hung himself in prison. Jasmine lost everything - but it was her own doing. Serious mental issues aside, Jasmine will do anything to get her old life back, which she thinks will happen if she goes back to school to study Anthropology. However, as all of us students know, that study life isn't cheap so instead she decides to become an interior designer by learning how to on the internet - but she needs to learn how to use a computer first. To stay afloat, she works as a receptionist for a dentist. Which is all very well and good, because she's taking a more practical approach towards getting her money back than Emily Taylor, but what I find most interesting about Jasmine's approach is that she still looks like she has money - taking every opportunity to stand out in her designer clothes and to point out that her luggage is indeed Louis Vuitton. And that's the way she defines herself. She doesn't have any applicable real world skills that would allow her to make her own money, but she has her clothes to give off the appearance that she's highly successful and elite, which is just where she wants to be. Blue Jasmine and Side Effects are both about how money can manipulate. Blue Jasmine is more about how money can manipulate consumerism, and how it is way cooler to have expensive labels to adorn you than actually be a good person. And Side Effects shows you how a person can be so manipulated by having money and then losing it, and the power of manipulation to get it back. Jasmine and Emily aren't particularly taken by the idea of actually earning their money, but instead manipulating everyone around them to get it. Side Effects definitely had the extreme way of going about it - but it is joining the leagues of films from 2013 that showed that money isn't always a good idea. Of course, it isn't a new idea, and yeah, it's sometimes a bit hard to swallow when the people who make these cautionary tales have their fair share of money (but in saying that, they worked hard to earn that). It's hard to ignore that 2013 has been the year of the construction and deconstruction of the American Dream. The year of the "money doesn't make you a good person". The year where money, consumerism, materialism, excess and debauchery were put under the spotlight, in several completely unique ways. We have The Bling Ring and Spring Breakers giving us teenage fantasies of money, with The Bling Ring focusing on the celebrity obsessed culture that enraptures teenagers, and Spring Breakers showing teenagers who are chewed up and spat out by the American Dream which comes in the form of the maniacal Alien, who introduces the girls to the violent side of getting what you want. 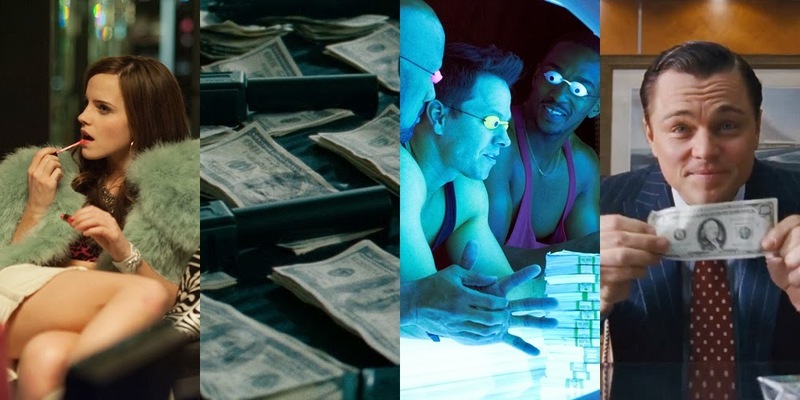 This is also explored in Pain and Gain, one of the more underrated films of this wave, which was mostly about the violence and how movie culture influences what people do to get money ("I've watched a lot of movies Paul, I know what I'm doing!"). The Wolf of Wall Street, which is probably the King of these movies, perhaps served us the biggest cautionary tale of all: how Jordan set up his wealth at the expense of others, and the ensuing controversy on whether or not the film glamorises the corruption and debauchery. I could go into book-length detail on what a test on society that film is, but it's hard to deny what a terrifying symbol Jordan Belfort is for our generation. And then we have Blue Jasmine and Side Effects both exploring what happens on the other side of money - one in a modern Hitchcockian thriller kind of way, and the other in a Woody Allen way. But if there's one thing these films have in common, it's that they're fuelled by this appearance driven society, where success isn't measured by who you are and what you do, but by who you appear to be. And every single one of them has characters that believes that success is money, and appear as heroes because of the money they have. Lately, I've been to a few leadership conferences where they say that success is achieved by doing what makes you happy. And in the purest form, that's what it is. But it is getting harder and harder to ignore the fact that now, in 2014, success is measured by money. These films all try to show disdain for this notion, but they're all signs of the time. "They're fuelled by this appearance driven society, where success isn't measured by who you are and what you do, but by who you appear to be." That just gets to the root of everything, there! Such an excellent consideration of the theme, and BLUE JASMINE is such a savvy assessment of it. It's weird, though, and yet I find myself feeling for Jasmine even at her worst. But, that's the power of money and material things. You become hitching your fate to whether you have them or not. A girl at a speech competition I was at talked about that same stuff, and it made me quite sad, but it was quite timely as I had just seen Side Effects. Definitely gave me a bit to mull over. Blue Jasmine is a great kind of expose of the power of money when it is no longer there. I am so confused about how I should feel about Jasmine. She's both awful and pitiable. I totally think that this theme will be studied in years to come. We live in an age when appearing to be cool has become really important. Otherwise how will we get all those "likes" or whatever. This is linked to having all sorts of things. It's a total cultural change and this year has been great in capturing it. Hahaha, it's probably because I have so little money that I enjoy writing about it so much! I felt sorry for Jasmine, because she really was helpless, but she did it to herself. It's such a strange moral complication. It's kind of scary to be so aware of how we are going through a change that will be looked at in years to come as 'history'. Especially when it is changing the way it is! This is a great post. I never thought of Side Effects in that way, but you're so right... it really is a movie about people doing whatever the hell they can to make a buck. That's the cleverness of this movie - it shows an extreme side to society that is the big obsession with money. Quite scary, really. Such a fantastic post! I didn't realize how much 2013 was revolved around money, and as you put so brilliantly: the construction and deconstruction of the American Dream. Great, great post Stevee! Thanks! 2013 will be a year that we'll go back to a lot, film wise. So many great films to compare! Awesome post! I would never have thought of Side Effects for this one. Great idea! Side Effects is quite a cunning film! Definitely deserved a bit more praise than it originally got. Nice job! I love the films you've selected to compare in these pieces. Thanks! I was quite lucky how they all seemed to correlate with each other.